Illustrations: 36 b/w photographs, 10 maps. In a work of splendid scholarship that reflects both a firm mastery of difficult sources and a keen intuition, one of Britain's foremost medievalists tells the story of the Christianization of Europe. 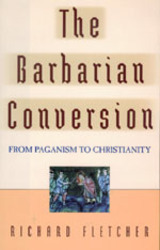 It is a very large story, for conversion encompassed much more than religious belief. With it came enormous cultural change: Latin literacy and books, Roman notions of law and property, and the concept of town life, as well as new tastes in food, drink, and dress. Whether from faith or by force, from self-interest or by revelation, conversion had an immense impact that is with us even today. It is Richard Fletcher's achievement in this superb work that he makes that impact both felt and understood. Richard Fletcher is Professor of History at the University of York. Among his books are Moorish Spain (California, 1992) and The Quest for El Cid (1989) which won the Los Angeles Times History Book Award and the Wolfson Literary Award for History.